Silver—and specifically sterling silver—has been used to create jewelry for centuries. At one time it symbolized wealth and prosperity, and even today it remains an important symbol of luxury and style. If you own genuine silver jewelry, such as Native American jewelry with sterling silver touches, of course you want to keep it in the best possible shape for generations to come, but how can you clean it without robbing the mineral of its luster? Maintaining your silver jewelry is easier than you think, as long as you follow the optimal procedures. 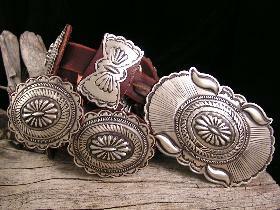 Eugene Charley (Navajo), Concha Belt, sterling silver. Image courtesy of Southwest Silver Gallery. You don’t want to bleach your silver jewelry or subject it to other harsh cleansers. The secret to cleaning silver is a chemical process known as ion exchange. You don’t need to be a chemist to understand how the process works. You just need a bit of aluminum foil (sometimes known as tinfoil) and laundry detergent. Even Reader’s Digest sings the praises of ion exchange. Just line a small bowl with foil, fill the bowl with hot water, and add a single tablespoon of your favorite bleach-free powdered laundry detergent. Then soak your silver inside the solution for one minute, rinse, and let it dry. You’ll be amazed by the difference. Ion exchange is a natural purification process, which removes impurities from chemical compounds (like silver). It’s an optimal approach for cleaning silver because it achieves and maintain a natural shine without drowning your silver in harsh chemicals that alter the composition of the material. The goal is to make your silver jewelry last for generations, and so it’s important to clean your jewelry in a way that thoroughly protects it without introducing foreign chemicals that alter or chip away the color. Other solutions, of course, can clean and preserve your jewelry without compromising the delicate nature of the silver. For instance, diluted ammonia will remove impurities, ensuring that your jewelry remains vibrant and unblemished. If you aren’t satisfied with the aluminum foil approach, just mix one part ammonia with two parts water and soak your jewelry for ten minutes. Alternately, Southwest Silver Gallery recommends soaking your silver in club soda overnight to restore any lost shine. Just a warning, do not soak jewelry with turquoise. The stone is highly porous. How Often Should I Clean My Silver? Cleaning your silver is the easy part. The challenge is understanding how often to subject your jewelry to the often-invasive cleaning process. Native American jewelry and other silver pieces tell an important historical story, and so you want to ensure that that your pieces effectively maintain their original sheen for as long as possible. When it comes to cleaning, don’t adhere to a schedule. Simply reserve the cleaning process for when it’s needed. Depending on how often you wear your jewelry, you may need to clean it once a month or once a year. Use your best judgment, but remember that the less often you subject your silver to cleaning, the more vibrant it will look over the long run.